Moles can be round, oval, flat, or raised. They can occur singly or in clusters on any part of the body. Most moles are brown, but colors can range from pinkish flesh tones to yellow, dark blue, or black. A mole usually lasts about 50 years before beginning to fade. Some moles disappear completely, and some never lighten at all. Some moles develop stalks that raise them above the skin's surface; these moles eventually drop off. Moles that are present at birth are called congenital nevi. Most moles are benign (not cancerous), but atypical moles (dysplastic nevi) may develop into malignant melanoma, a potentially fatal form of skin cancer . Atypical moles are usually hereditary. Most are bigger than a pencil eraser, and the shape and pigmentation are irregular. Congenital nevi are more apt to become cancerous than moles that develop after birth, especially if they are more than eight inches in diameter. Lentigo maligna (melanotic freckle of Hutchinson), most common on the face and after the age of 50, first appears as a flat spot containing two or more shades of tan. It gradually becomes larger and darker. One in three of these moles develop into a form of skin cancer known as lentigo maligna melanoma. Nearly everyone has at least a few moles. They generally appear by the time a person is 20 and at first resemble freckles. A mole's color and shape do not usually change; however, changes in hormone levels that occur during puberty and pregnancy can make moles larger and darker. New moles may also appear during this period. About 1 to 3 percent of all babies have one or more moles when they are born. Only about one in 1 million moles is cancerous. The cause of moles is unknown, although atypical moles seem to run in families and result from exposure to sunlight. During the early 2000s, researchers identified two genes known as CDKN2A and CDK4 that govern susceptibility to melanoma in humans. Other susceptibility genes are being sought. Most experts, however, think that these susceptibility genes are not sufficient by themselves to account for moles becoming cancerous but are influenced by a combination of other inherited traits and environmental factors. A doctor who suspects skin cancer will remove all or part of the mole for microscopic examination. This procedure, which is usually performed in a doctor's office, is simple, relatively painless, and does not take more than a few minutes. It does leave a scar. The doctor may also use a dermatoscope to examine the mole before removal. The dermatoscope, which can be used to distinguish between benign moles and melanomas, is an instrument that resembles an ophthalmoscope used to look at the eye. An oil is first applied to the mole to make the outer layers of skin transparent. A combination of high-frequency ultrasound and color Doppler studies has also been shown to have a high degree of accuracy in distinguishing between melanomas and benign moles. If laboratory analysis confirms that a mole is cancerous, the dermatologist will remove the rest of the mole. Patients should realize that slicing off a section of a malignant mole will not cause the cancer to spread. Removing a mole for cosmetic reasons involves numbing the area and using scissors or a scalpel to remove the elevated portion. 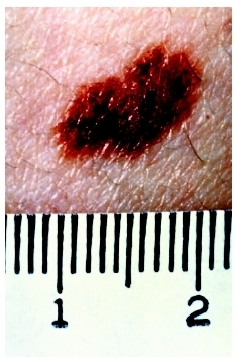 The patient is left with a flat mole the same color as the original growth. Cutting out parts of the mole above and beneath the surface of the skin can leave a scar more noticeable than the mole. Scissors or a razor can be used to temporarily remove hair from a mole. Permanent hair removal, however, requires electrolysis or surgical removal of the mole. Moles are rarely cancerous and, once removed, unlikely to recur. A dermatologist should be consulted if a mole reappears after being removed. Wearing a sunscreen and limiting sun exposure may prevent some moles. Anyone who has moles should examine them every month and see a dermatologist if changes in size, shape, color, or texture occur or if new moles appear. A team of researchers at Duke University reported in 2003 that topical application of a combination of 15 percent vitamin C and 1 percent vitamin E over a four-day period offered significant protection against sunburn . The researchers suggest that this combination may protect skin against aging caused by sunlight as well. A mole with any of these characteristics should be evaluated by a dermatologist. Advances in photographic technique had as of 2004 made it easier to track the development of moles with the help of whole-body photographs. A growing number of hospitals are offering these photographs as part of outpatient mole-monitoring services. Close up of a mole. Very few moles are cancerous. Moles on the face or other frequently exposed areas of skin may be troubling for children. If a child is particularly troubled by a mole, a dermatologist can be consulted about its possible removal, although this often leaves a scar. Dermatology —The branch of medicine that studies and treats disorders of the skin. Melanin —A pigment that creates hair, skin, and eye color. Melanin also protects the body by absorbing ultraviolet light. Nevus (plural, nevi) —The medical term for any anomaly of the skin that is present at birth, including moles and birthmarks. Crowson, Neil A., et al. The Melanocytic Proliferations: A Comprehensive Textbook of Pigmented Lesions. New York: Wiley-Liss, 2001. Thompson, June. Spots, Birthmarks, and Rashes: The Complete Guide to Caring for Your Child's Skin. Westport, CT: Firefly Books, 2003. "About Moles, Melanomas, and Lasers: The Dermatologist's Schizophrenic Attitude toward Pigmented Lesions." Archives of Dermatology 139 (November 2003): 1405–7. Bates, Betsy. "Imaging Devices Assist in Skin Cancer Diagnosis." Family Practice 33 (January 1, 2003): 18. Chamilin, Sarah L. "Shedding Light on Moles, Melanoma, and the Sun." Contemporary Pediatrics 19 (June, 2002): 102–10. American Academy of Dermatologists. PO Box 4014 Schaumburg, IL 60168–4014. Web site: http://www.aad.org.